Auntie Em's Studio: A football for Thanksgiving! Happy Thanksgiving everyone! I'm beginning to try selling some of my patterns on ravelry. 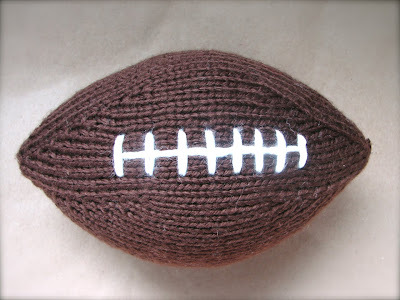 In fitting with the holiday (and because it is the only one that is all edited and ready to sell) I have posted my pattern for the hand knit football. It has been one of my most popular sellers in my etsy shop and is super easy to make. Check out my etsy listing and ravelry pattern. Enjoy your holiday and happy knitting!